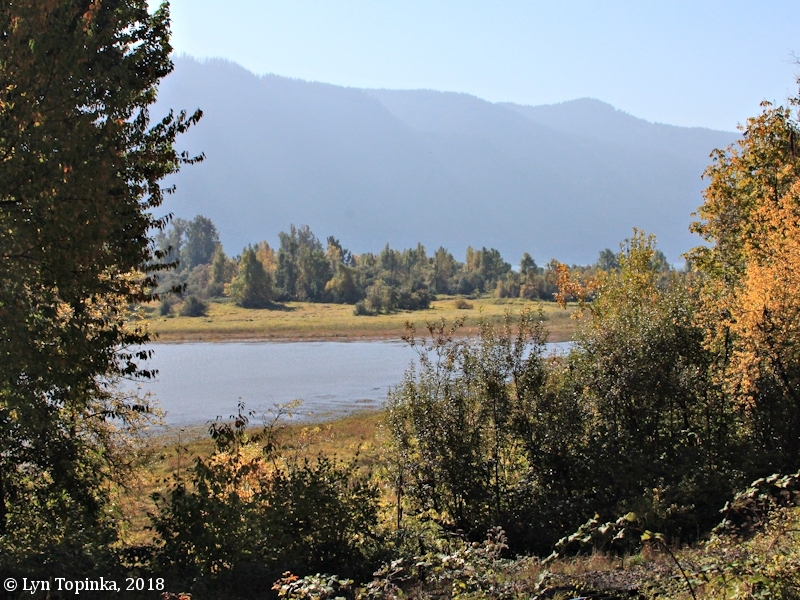 "Franz Lake, the Franz Lake National Wildlife Refuge, and Indian Mary Creek, Washington"
Click image to enlarge Franz Lake National Wildlife Refuge, Washington. View from overlook off of Washington State Highway 14. Image taken October 25, 2003. The Franz Lake National Wildlife Refuge is located on the Washington side of the Columbia River at River Mile (RM) 138, and is one mile upstream of the St. 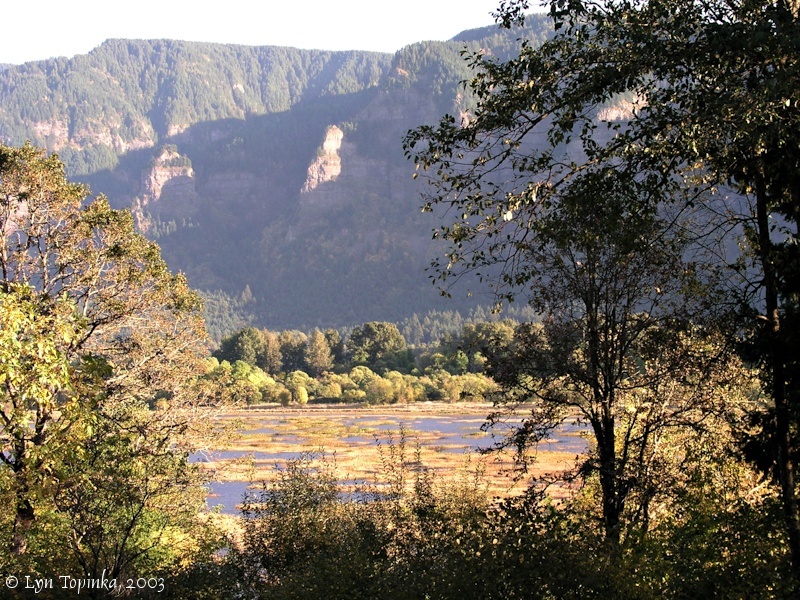 Cloud Wayside and four miles downstream of Beacon Rock State Park and the Pierce National Wildlife Refuge. 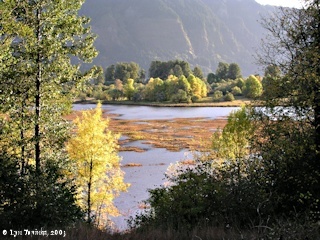 Just upstream of the Refuge is the small Washington community of Skamania Landing. The Franz Lake Refuge is within the Columbia River Gorge National Scenic Area, and is a popular place for wintering tundra swans. 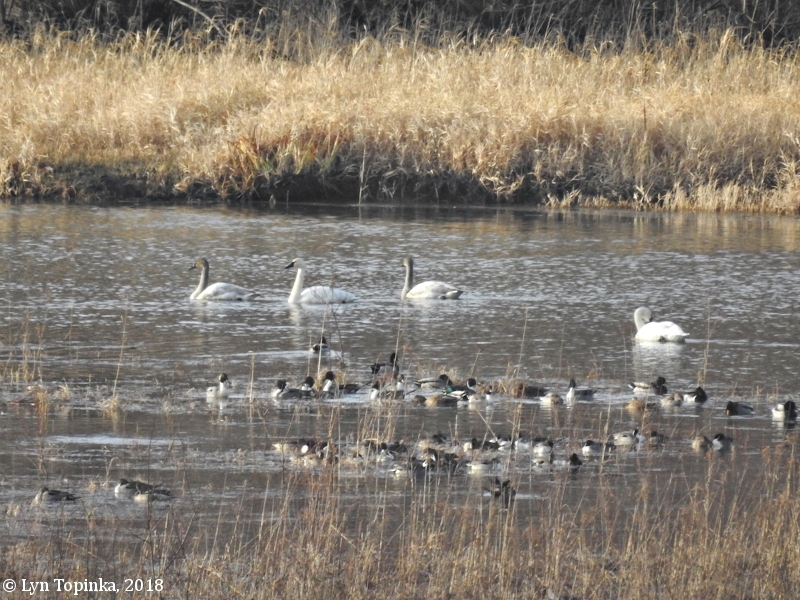 Its system of river streams and wetlands provide habitat for breeding, migrating and wintering waterfowl and other aquatic migratory birds and raptors such as bald eagles. It may be viewed from an overlook located near Washington State Highway 14 at milepost 31. On a clear day Horsetail Falls is visible to the southeast across the Columbia on the Oregon side. 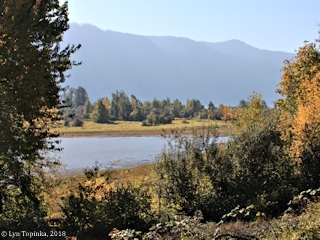 The Franz Lake refuge is a part of the Ridgefield National Wildlife Refuge complex, along with nearby Steigerwald Lake Refuge downstream (RM 126), and Pierce Refuge upstream (RM 142). "Franz Lake Refuge is located in Skamania County, Washington, approximately one mile east of the town of Skamania and ten miles upriver from Steigerwald Lake Refuge. The Service currently owns about 552 acres of the approved 695-acre (79 percent) acquisition boundary. Franz Lake Refuge was established in 1990 under authority of the Fish and Wildlife Act of 1956. 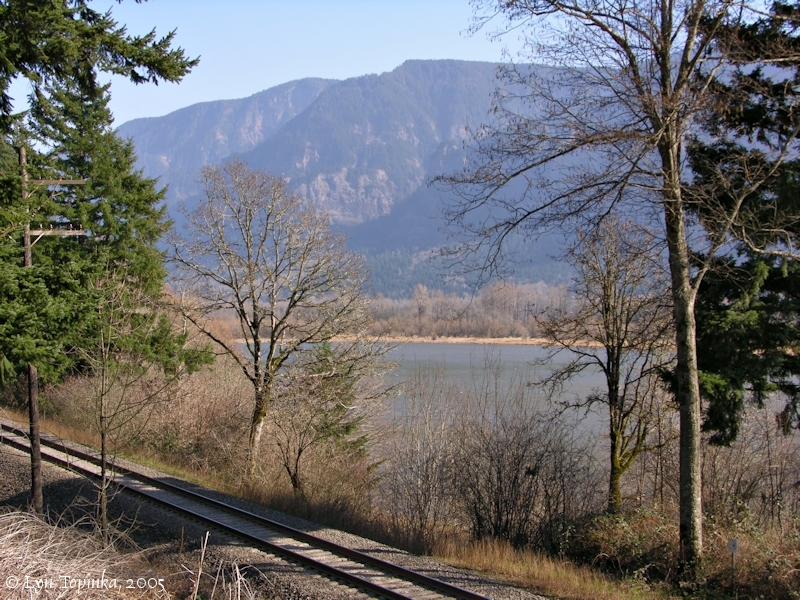 The Refuge's purpose is "to preserve biodiversity along the Columbia River by protecting diverse and now rare Columbia River floodplain wetland and riparian habitat and forested watershed buffers." Source: U.S. Fish & Wildlife Service, 2004, "Draft Comprehensive Conservation Plan ..."
Click image to enlarge Franz Lake National Wildlife Refuge, Washington. View from overlook off of Washington State Highway 14. Image taken January 13, 2018. Franz Lake is located on the Washington side of the Columbia River, and it is located in the Franz Lake NWR, at the lower end of the drainage of Indian Mary Creek. Originally there was one lake called "Arthur's Lake". Today however the drainage has formed a smaller lake east ("Franz Lake") and slough. Indian Mary Creek is the drainage creating Franz Lake. When Kalliah grew up, she returned to the Cascades and married a Wish-ham man Henry Will-wy-ity, the last name used on her tombstone and some legal documents. After her husband's death in the 1870s, Kalliah married Johnny Stooquin, a Cascade man, and traded horses for a 160-acre parcel of land just downriver from Che-che-op-tin (Beacon Rock). Kalliah's brother Joseph Tumulth built her a cabin where her daughters Amanda Stooquin Williams and Abbie Weiser Estabrook were born and raised. A few months before her death in December 1906, Kalliah was forced to move because the Southern Pacific & Southwestern railroad was building tracks by her cabin. She is buried with her mother, her two sons (who died in childhood), and most of her family in the Cascade Cemetery near North Bonneville. This cemetery, which includes a mass grave of Cascade people relocated from the main cemetery on Bradford Island during the construction of Bonneville Dam, was called the Cascade Pioneer Cemetery. In 1992, following the death of Kalliah's grandson Clyde Williams, the cemetery was renamed the Cascade Indian & Pioneer Cemetery." Source: "Kalliah Tumulth (Indian Mary) (1854-1906)", IN: "The Oregon Encyclopedia", 2019. Franz Lake is named for Jacob and/or John Franz, brothers who emigrated from Switzerland. They owned the property around the lake. The 1910 federal census for Skamania County shows Jacob Franz, age 40, John, age 29, and John's wife Marie, age 27 and from Switzerland, and two children, May, age 3 and born in Oregon, and Rubie, age 1 and born in Washington. An early name for Franz Lake was "Arthur's Lake" or "Arthur Lake". 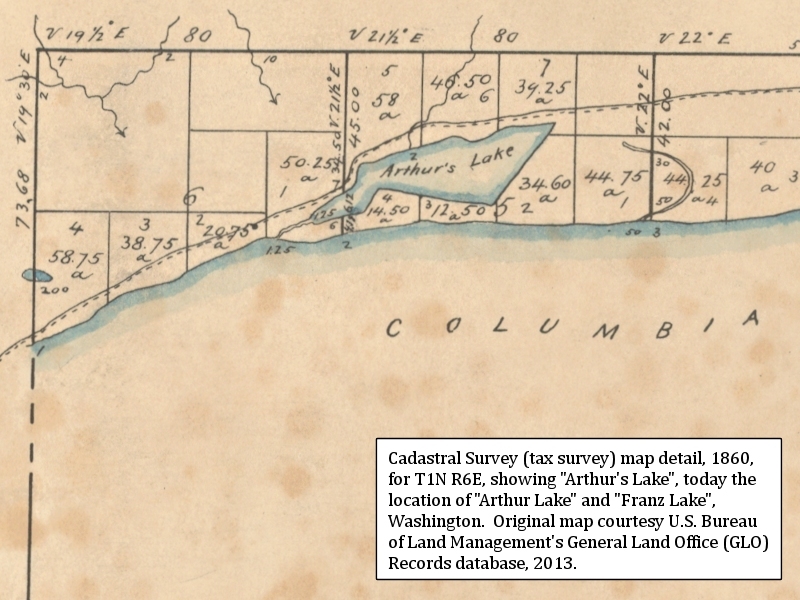 An 1860 Washington Territory cadastral survey (tax survey) of T1N R6E shows one large lake named "Arthur's Lake". In 1948, the NOAA Chart No.6156, "Columbia River Vancouver to Bonneville" shows two lakes but left the area unnamed. The 1967 chart shows two lakes and has the area labeled "Arthur Lake". The current chart shows two lakes and has the area labeled "Franz Lake". In 1987 the U.S. Board of Geographic Names made "Franz Lake" the official name. "The feature is an oblong shape lake measuring 1/2 mi. x 1/4 mi. 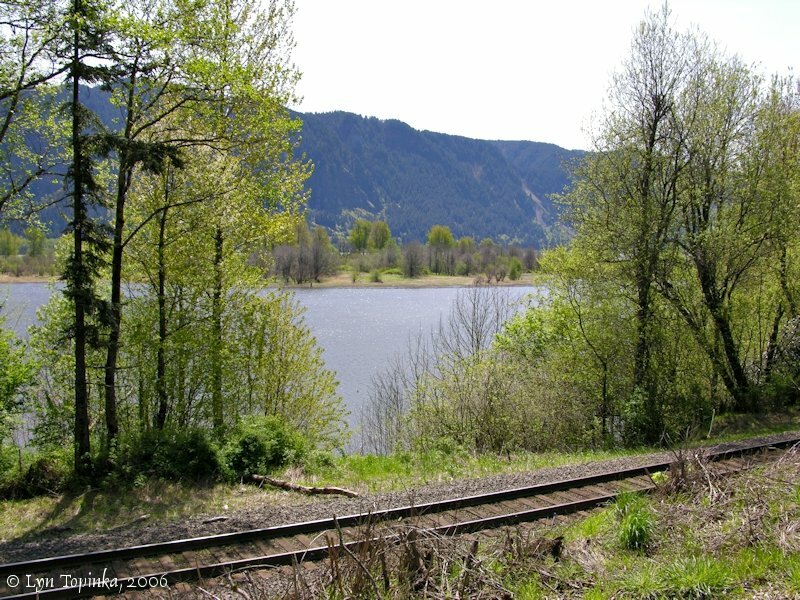 It is located about 1.5 miles west of Skamania with an elevation of approximately 20 ft. 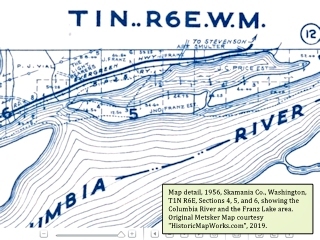 It is located in the N 1/2 of section 4/T 1N/R 6E, Willamette Meridian (Washington). The 1980 NOAA Chart applies the name Arthur Lake to the slough in section 5 as well as the lake in section 4/T 1N/R 6E. The name Arthur Lake originally appeared on the 1860 Land Plat of that township. It should be noted that the Land Plat only applied the name to the slough in section 5. 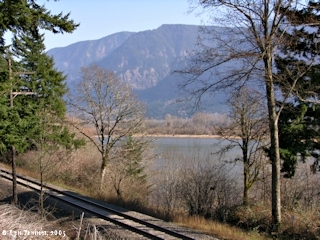 It is assumed that the name Arnold Lake on the SCS study (SCS, Soils Survey, Skamania Co., 1956) is a incorrect transcription of the name Arthur Lake. The name Franz Lake comes from an early settler and land owner in the area, John Franz, who first arrived in 1907. 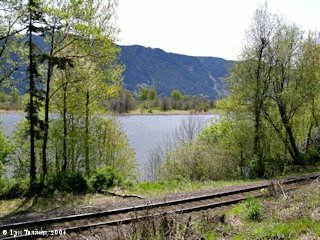 All long time residents of the immediate Skamania/Stevenson area know the lake in section 4 as Franz Lake. No respondents knew the slough in section 5 as Arthur Lake, although one had seen that named applied to the slough in a Corps of Engineers study of the area. Source: U.S. Board of Geographic Names database, Franz Lake Domestic Geographic Names (DGN) report, by William P. Kaiser, U.S. Geological Survey, March 25, 1986. 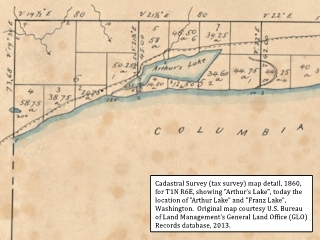 Click image to enlarge 1860 Cadastral survey map (tax survey) detail for T1N R6E, showing "Arthur's Lake", the location of today's Arthur Lake and Franz Lake, Washington. Original cadastral survey map courtesy U.S. Bureau of Land Management's General Land Office (GLO) Records database, 2013. 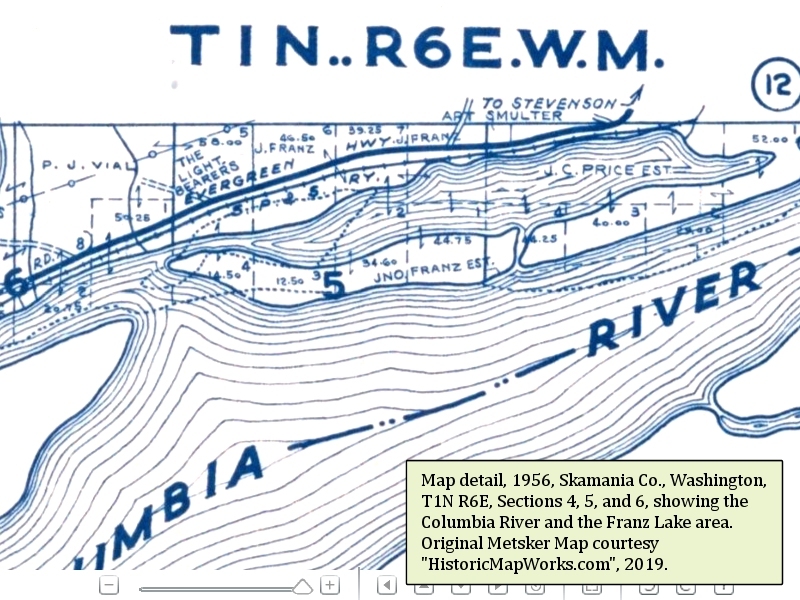 Click image to enlarge 1956 Skamania County map detail for T1N R6E, showing the Franz Lake area, Washington. Note the properties of "J. Franz" and "Jno. Franz". Original map courtesy "HistoricMapWorks.com", 2019. Click image to enlarge 1967, NOAA Chart detail, showing the Columbia River from St. Cloud, Washington, to Beacon Rock, Washington. 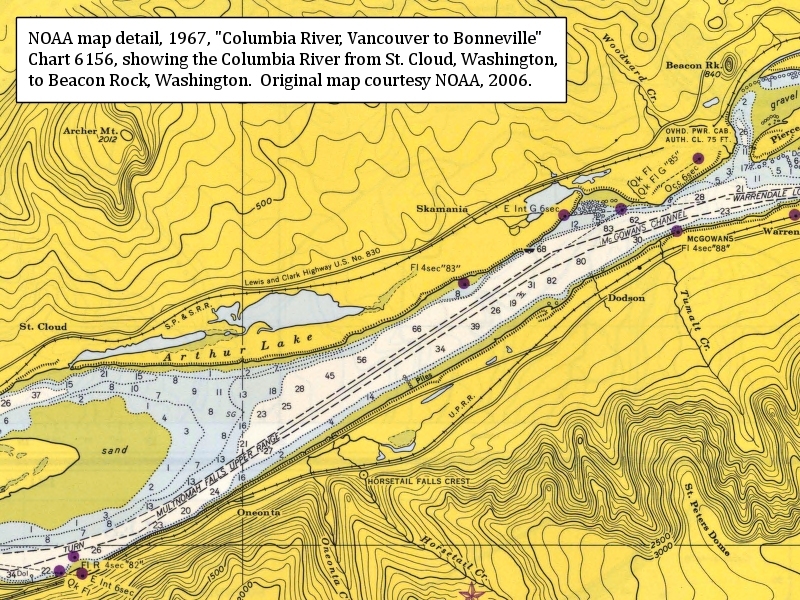 Original "Columbia River - Vancouver to Bonneville", Chart 6156, courtesy NOAA Charts, 2006. 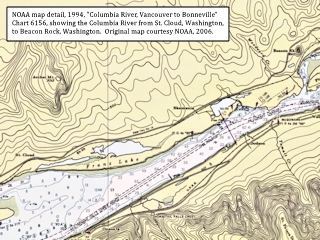 Click image to enlarge 1994, NOAA Chart detail, showing the Columbia River from St. Cloud, Washington, to Beacon Rock, Washington. 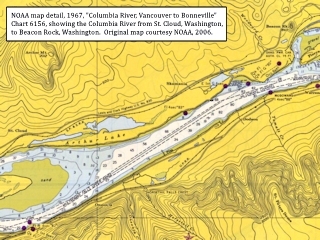 Original "Columbia River - Vancouver to Bonneville", Chart 6156, courtesy NOAA Charts, 2006. 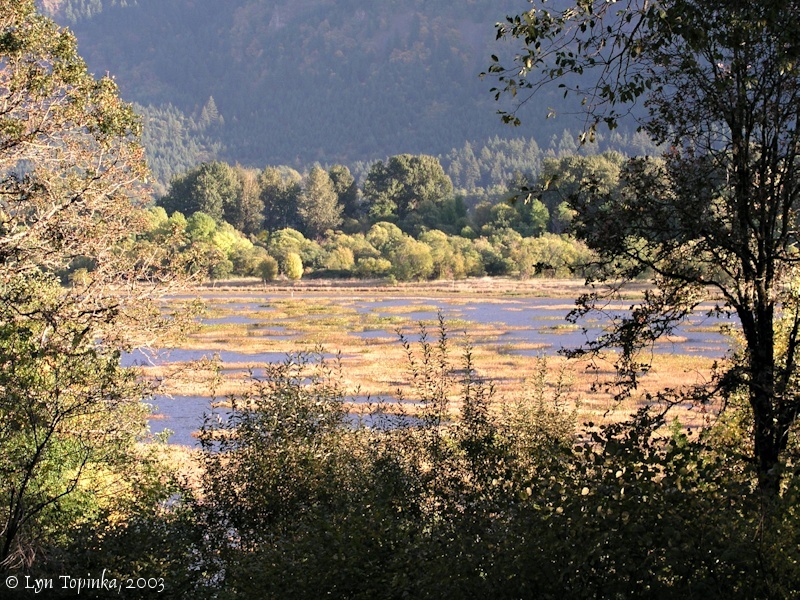 Click image to enlarge Franz Lake National Wildlife Refuge, Washington. View from overlook off of Washington State Highway 14. Image taken October 20, 2018. Click image to enlarge Franz Lake National Wildlife Refuge, Washington. View from overlook off of Washington State Highway 14. Image taken February 26, 2005. 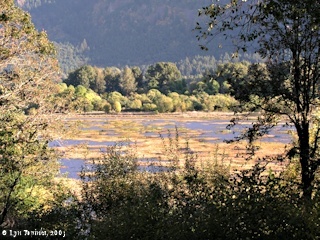 Click image to enlarge Franz Lake National Wildlife Refuge, Washington. View from overlook off of Washington State Highway 14. Image taken April 22, 2006. 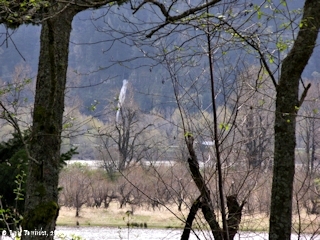 Horsetail Falls can be seen from the Franz Lake National Wildlife Refuge on the Washington side of the Columbia River. 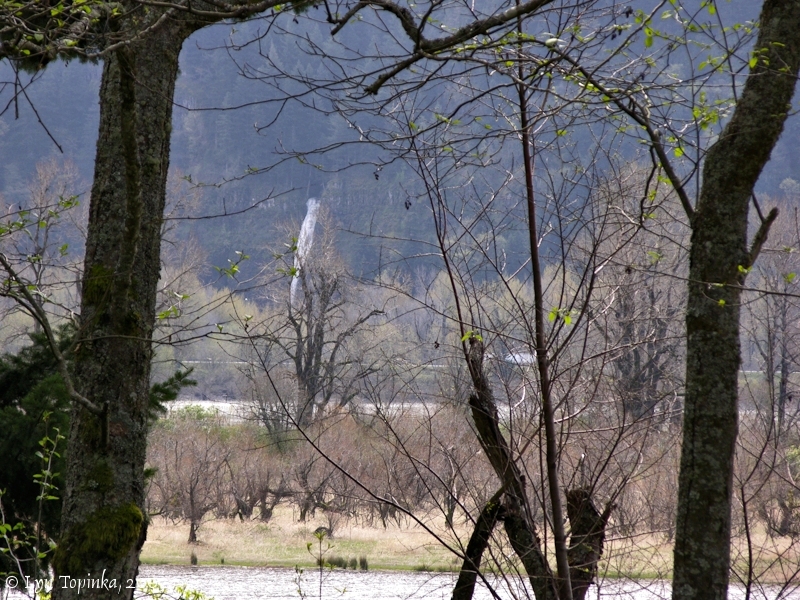 Click image to enlarge Horsetail Falls, Oregon, as seen from Franz Lake National Wildlife Refuge, Washington. View from Washington State Highway 14. Image taken April 2, 2005.